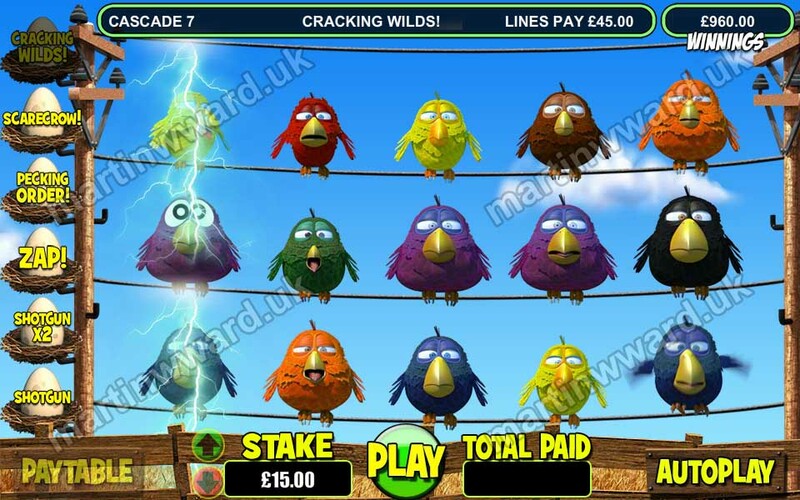 Birdz is a cascading 5-reel slot game with a bonus trail. Instead of traditional spinning reels, symbols fly into view. All line pay symbols are eliminated. The remaining symbols then cascade, and empty places are replenished from above. Do you fancy a flutter? 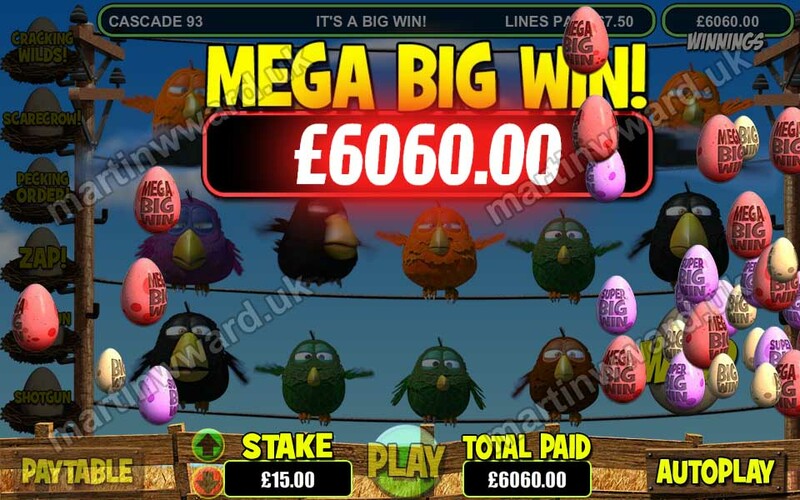 Are you looking for the chance to win a nice little nest egg from a game with no poultry wins? A little birdie tells us that this swan is for you! Have a gander at the prizes on offer! You're in for a tweet with these little flockers! To win, the player must match 3 or more symbols on any of the 30 win lines. 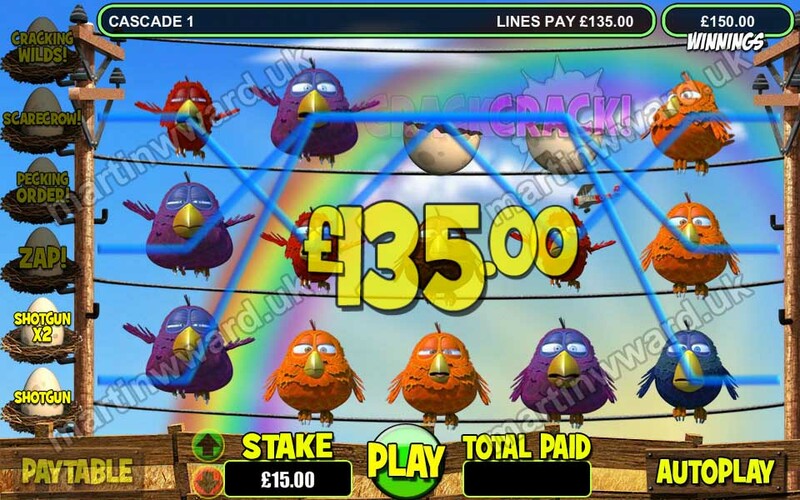 All line pay symbols must appear on a win line and on consecutive reels beginning with the far left reel. Only the highest win is paid on each win line. Coinciding wins on different win lines are added. All bonus wins are added to pay line wins. The egg symbol is wild, and substitutes for any symbol. 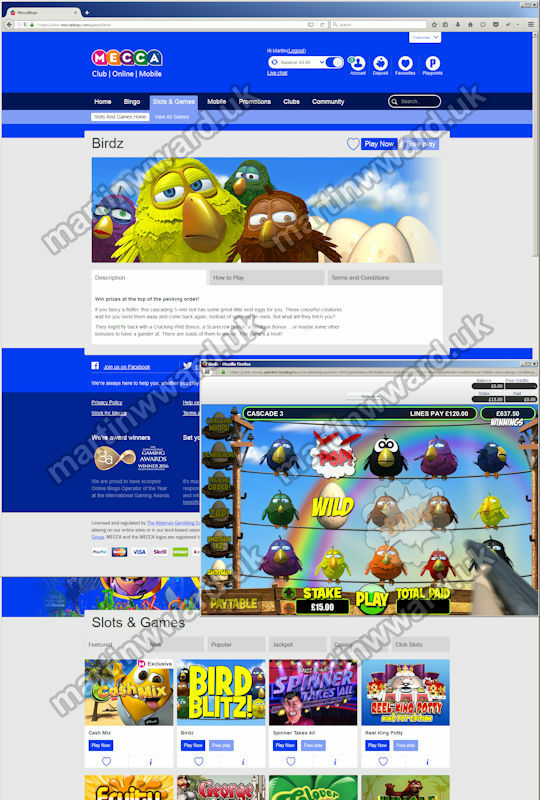 The Bird Blitz Bonus is activated at random at the end of an otherwise non-winning game. 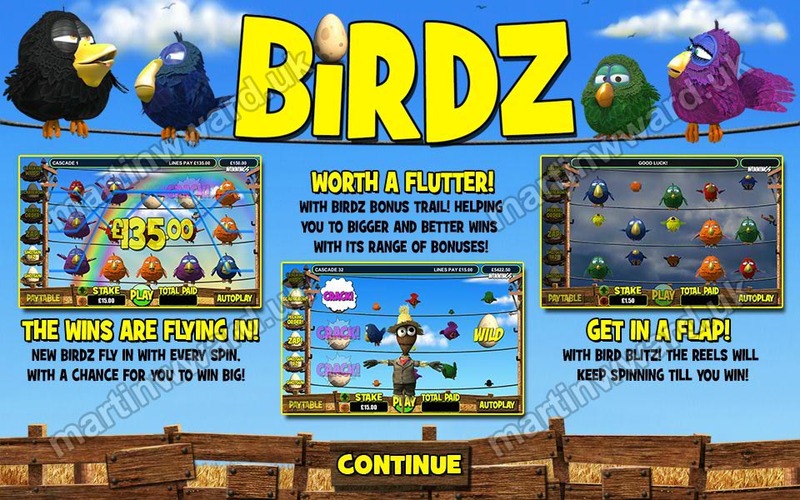 In the Bird Blitz Bonus, birds keep flying out and in until a winning combination of birds flies in. For every spin, cascade, or bonus that results in a win, the trail position increases by one. For every spin, cascade, or bonus that does not result in a win, the bonus at the current trail position will be activated. If all bonuses have been used, the game ends. In the Shotgun Bonus, a symbol is selected from the first 3 reels and eliminated with the shotgun. The remaining symbols then cascade, and the empty place is replenished from above. In the Shotgun X2 Bonus, 2 symbols are eliminated. 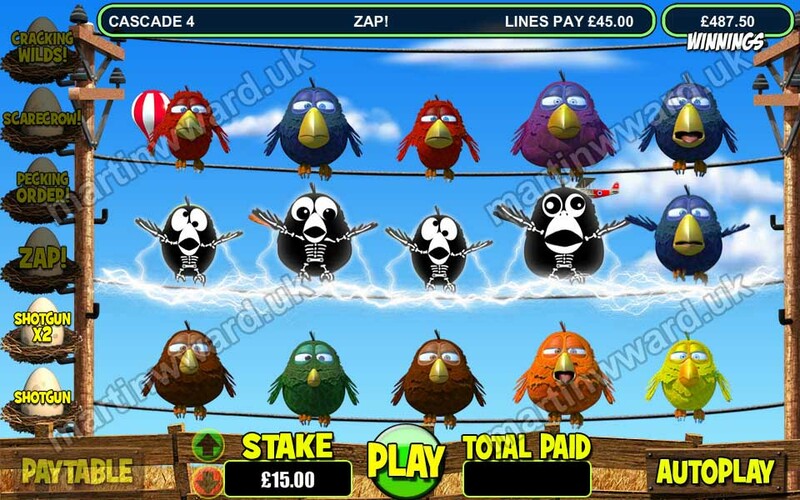 In the Zap Bonus, one of the 3 bird wires is electrified. All of the symbols on the electrified wire are eliminated. The remaining symbols then cascade, and the empty places are replenished from above. The wire to be electrified is always one with the least number of wild symbols. 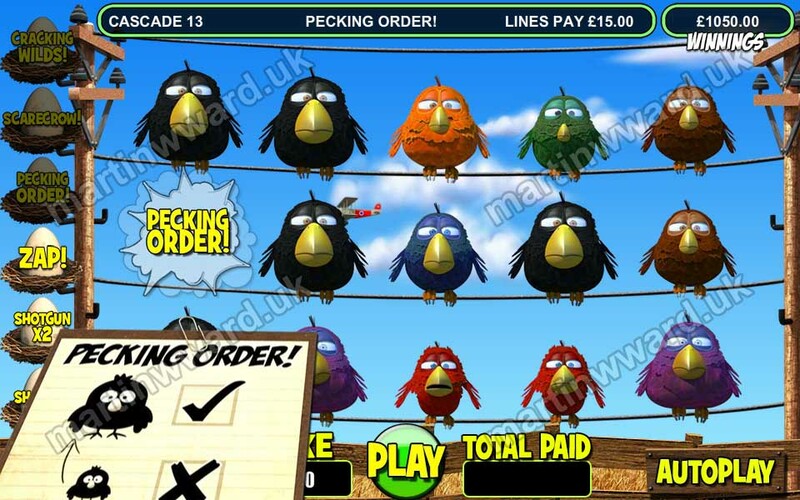 In the Pecking Order Bonus, a minimum of 3 of the lowest value symbols are replaced with matching higher value symbols. 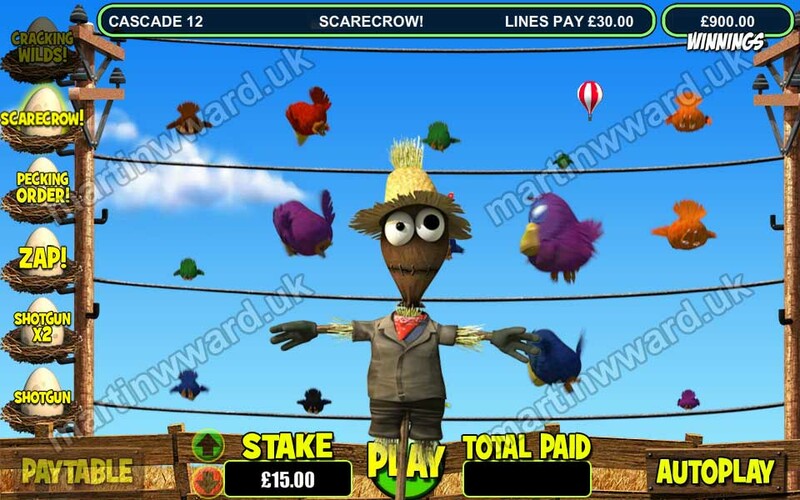 In the Scarecrow Bonus, the scarecrow scares all the birds away. All the symbols are replaced with new symbols. In the Cracking Wilds Bonus, all of the symbols on one of the first 3 reels are replaced with wild symbols. Martin added several extra touches to his Flash version of Birdz that aren't present in the more basic HTML5 game. Every time a bird symbol is eliminated, a shocked-looking GHOST BIRD appears in its place. Ghost birds are the spirits of the eliminated birds. They ascend into the sky and fade out of view. 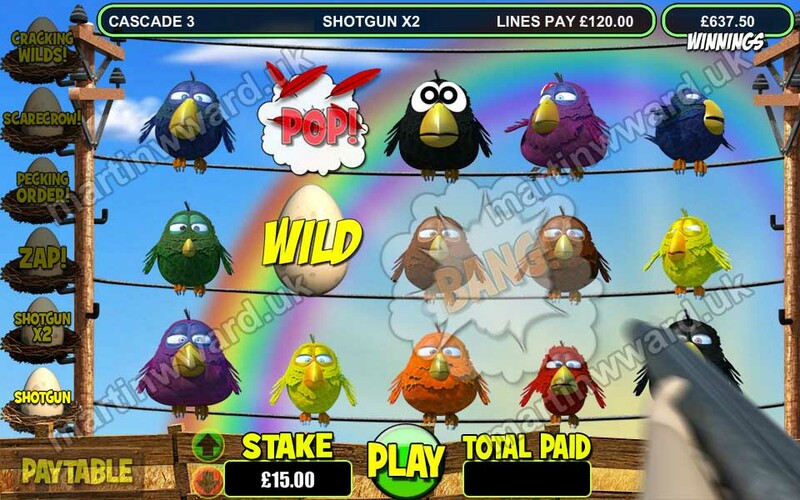 Fruit machines have a long tradition of using puns, either in the game title, or in feature names. 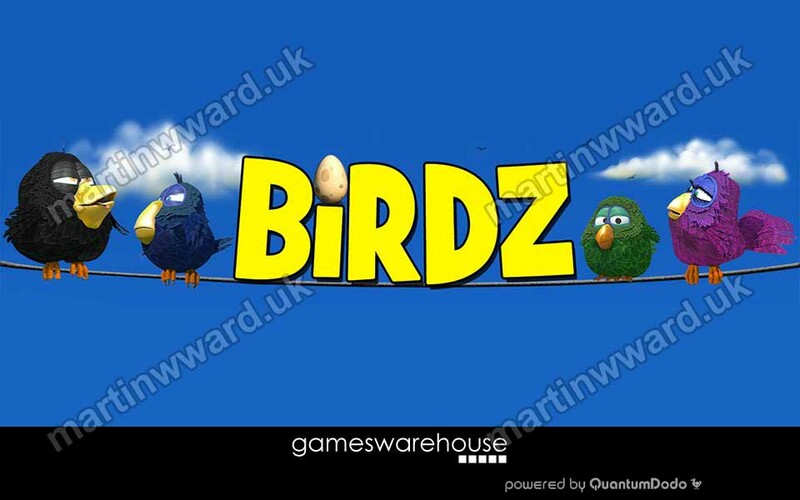 Birdz is no egg-ception, Martin added a punnet-full of puns for the punters. 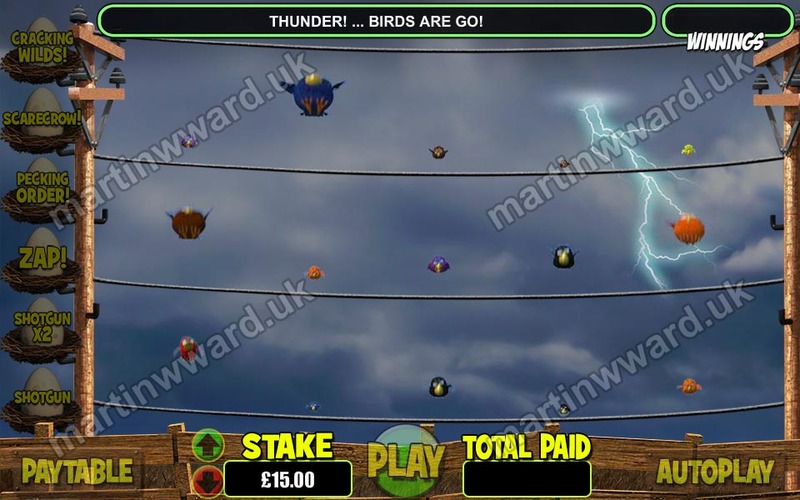 After every press of the PLAY button, a random bird-related phrase is displayed in the game's display bar. Players who enjoy bad puns are in for a tweet with these little flockers! 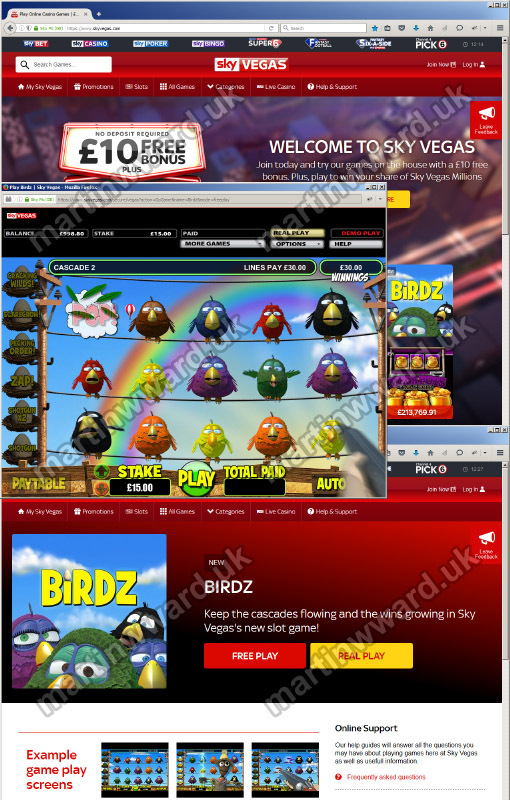 Martin completed the AS3 game code for Birdz in February 2015, and integrated the game with OpenBet's server in early 2015. 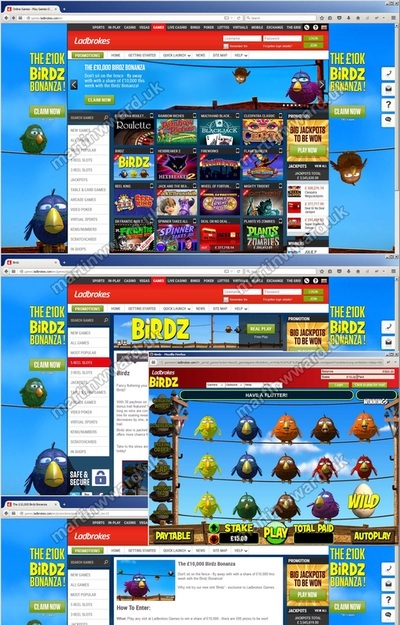 Birdz was launched on Ladbrokes in November 2015. The game was released on other platforms, including SkyVegas, William Hill and MeccaBingo, in 2016.